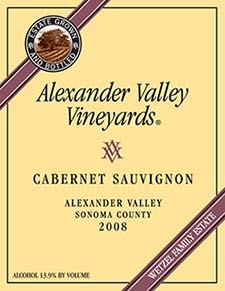 Alexander Valley Vineyards already includes "Sonoma County" on its label. On Sept. 24, California Gov. Arnold Schwarzenegger signed into law AB1798, the Sonoma County conjunctive wine label initiative. The new law takes effect Jan. 1, with a three-year phase-in period. Wineries must comply by Jan. 1, 2014. What does this mean for Sonoma County wineries? Nothing, if wineries don’t designate one of Sonoma County’s 13 AVAs on their label. If they do, they have two options: Comply with the state-mandated law and place the words “Sonoma County” on their approved label, or drop the AVA entirely. Both options require a label redesign and the filing of a new COLA (Certification of Label Approval) with the TTB. This is non-negotiable: The California Department of Alcoholic Beverage Control (ABC) will suspend or revoke the license of any person who violates the provisions, amounting to a criminal misdemeanor.